An article from the mainstream media on the annual 'UnFreedom Day' rally held each year by Abahlali baseMjondolo in Durban as a counter event to the national public holiday 'Freedom Day'. Thousands of people, from various parts of the country, participated in the event. The movement affirmed its commitment to the collective ownership and democratic management of land, outside of the logic of capital. Morakane Moloi left her home in Tembisa, Ekurhuleni at midnight on Saturday, 21 April, bound for Abahlali baseMjondolo’s annual UnFreedom Day rally more than 600km away. Moloi was among Abahlali members who gathered for the rally at the foot of the now historic Kennedy Road shack settlement, outside Durban, where the shack dwellers’ movement began in 2005. It was her first UnFreedom Day. She made the trip to Sunday’s rally at the Springfield Park sports ground together with the other members of a fledgling Abahlali branch in Vusimuzi shack settlement, east of Johannesburg. Moloi said that Vusimuzi residents have formed the branch to resist the demolition of their homes by the City of Ekurhuleni. Four SAPS and Public Order Police vans looked on in withering heat as Moloi and her fellow Abahlali members from Gauteng, Mpumalanga, KwaZulu-Natal and the Eastern Cape used the rally to draw attention to the limits of South Africa’s democracy. 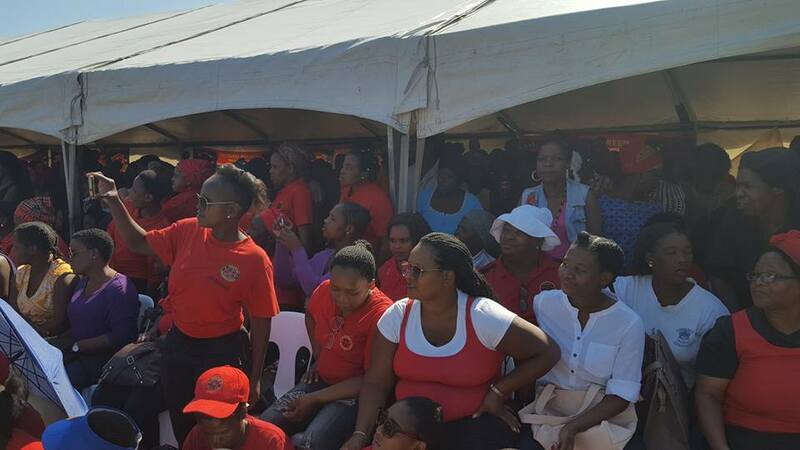 Abahlali now has 50,000 audited members in good standing, according to president, S’bu Zikode. This represents an immense growth since 2014, when membership was closer to 14,000. Bishop Rubin Phillip, the former Anglican bishop of KwaZulu-Natal and long-time Abahlali supporter, said that Abahlali’s sustainability of membership and organisation is unique among post-apartheid social movements. He said the movement’s remarkable growth is a result of “high levels of organisation” and taking up “issues that are of concern at the grass roots – land and housing”. He said people are drawn to the “sense of worth” offered by the movement. Phillip compares Abahlali to the Black Consciousness Movement of the early 1970s. Back then he was the deputy president of the South African Student’s Organisation (SASO) at the time when Steve Biko was its president. Abahlali’s General Secretary Thapelo Mohapi told Daily Maverick that the increase in the movement’s membership “speaks to the high state oppression” of people who have occupied land in SA cities. Mohapi also said that many ordinary people are beginning to see Abahlali as the only realistic avenue to “expropriate land from below”. “We give people the freedom to do things democratically,” explains Mohapi, “rather than impose processes on them as we are seeing in Parliament”. The movement has rejected land expropriation without compensation which is driven by the EFF and ANC in Parliament as “a lie to lure votes”. Abahlali’s calls for land expropriation date as far back as its first press statement in 2005. But it says that the current deliberations in Parliament are made hollow by the ongoing repression of urban land occupations. The movement has also raised concerns over the form that land expropriation might take under the current government, invoking the spectre of elite capture. Zikode outlined the movement’s position on the South African land question in his UnFreedom Day address entitled The Politics of UnFreedom Day. According to Zikode, the social value of land is of a higher order than its commercial value. The expropriation imagined by the ANC and EFF would leave land in elite hands, and the structure of private property unchanged, he said. The movement has called for the notion of private property, which was “imposed by colonial conquest”, to be undone in favour of collective forms of ownership. Occupying land in South Africa’s cities – what the movement has called “urban planning from below” – has come at no small cost to Abahlali and its members. In 2014, ANC ward councillors Mduduzi Ngcobo and Velile Lutsheko hired Mlungisi Ndlovu to assassinate Abahlali leader Thulisile Ndlovu. They have since been sentenced to life in prison. Ndlovu, and other Abahlali members whose lives have been claimed in the struggle for land, were saluted on UnFreedom Day. According to Abahlali’s testimony during the Moerane Commission – which was established to investigate political killings in the province – in 2017, the politically motivated killing and intimidation of its members runs much deeper than the assassination of Ndlovu. The findings of the commission are set to be handed over to KZN Premier Willies Mchunu by the end of the April. Phillip said that the KZN provincial government, including Mchunu, “needs to rid itself of negative feelings to Abahlali and begin to see them as partners and collaborators in a common cause”. Phillip said that all levels of government involved in the expropriation and development of land have a lot to learn from Abahlali’s members, who have “lived the realities of land expropriation”.